Since 1999 European higher education has been engaged in the most radical reform of its 900 years of history. This volume brings together a group of higher education researchers across Europe and looks into the implementation of the Bologna Process in the countries often attributed a peripheral status. In addition to cultural and political issues, the volume pays particular attention to the role of students as well as the changing position of the intellectuals under its impact. 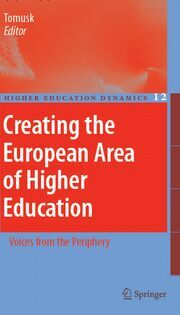 AcknowledgmentsIntroduction: COM(91) 349 final and the Peripheries of European Higher Education. What is the Point of Bologna in National Reform? The Case of Norwegian Quality Reform in Higher Education. The Bologna Process in Finland: Perspectives from Basic Units.Searching for the Sub-Plot Between the Lines of Bologna: Qualms and Conservatism of the French Academia in the Face of European Competition. Emergent European Educational Policies Under Scrutiny: The Bologna Process from a Central European Perspective.The Bologna Process: An Estonian Perspective. What the Bologna Process says about Teaching and Learning Development in Practice: Some Experience from Macedonia. Restructuring Bulgarian Higher Education: The Bulgarian Strategy Towards The Bologna Declaration.Turkish Academics in Europe: Nomads Chasing a European Dream.The Challenge of Bologna: The Nuts and Bolts of Higher Education Reform in Georgia. Pizza Bolognese à la Russe: Promise and Peril of the Bologna Process in Russia. European Students in the Periphery of the Bologna Process. The End of Europe and the Last Intellectual: Fine-Tuning of Knowledge Work in the Panopticon of Bologna.